Aberdeen manager Derek McInnes believes the strength and spirit of his young Dons can make the difference as they enter the final stretch of the campaign. The Dons are sitting third in the Scottish Premiership with eight games remaining and have a Scottish Cup semi-final against Celtic at Hampden to look forward to next month. McInnes’ side return to action following the international break when they travel to Tynecastle on Saturday to take on a Hearts side beaten 1-0 by Hamilton Accies on their last outing. The Dons manager reckons the recent Scottish Cup quarter-final victory against Rangers and draw with leaders Celtic in Glasgow should give his players plenty of confidence as they fight on two fronts. He said: “We are a younger team this year. “While we have beaten Celtic and Rangers in the different years we have been here the way we have done it recently has been really pleasing. “There is a strength and resilience about the team and a real spirit amongst them. “We went down to 10 men at Ibrox in the league (in December), when Sam Cosgrove got sent off, but that was massive in terms of getting the desired result, after everything that was thrown at us. We have shown an ability to defend well and that has provided the platform because one goal was enough at Ibrox and at Hampden in the semi-final and one was enough at Celtic Park last season. McInnes says Connor McLennan, Greg Stewart and Andrew Considine should be fit to make the trip to Tynecastle this weekend. McLennan missed out on Scotland under-21 duty due to an on-going knee injury, while midfielder Lewis Ferguson is a doubt after dropping out of the same squad with a thigh strain. Stewart has been struggling with a hip issue and Considine missed the 1-1 draw with Livingston before the international break with a calf injury. 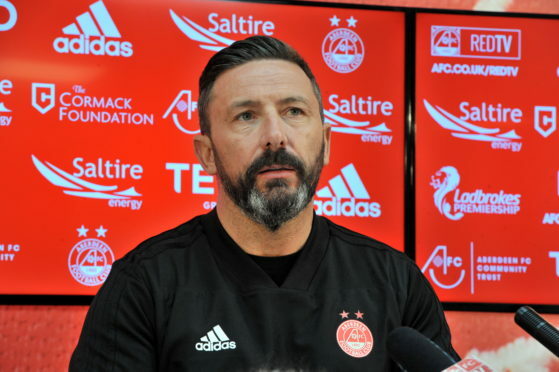 While the Dons are determined to move closer to making certain of a top three finish that would guarantee European football, McInnes admits success in the Scottish Cup is the main aim for his side over the closing stretch. He added: “The players give so much all year-long and ultimately you want a reward at the end of it.